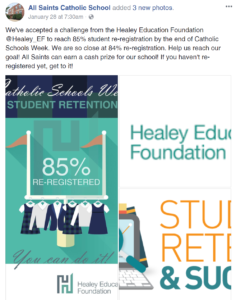 Fifteen of nineteen eligible Healey partner schools achieved re-registration rates of 85% or higher by the close of Catholic Schools Week. The 2018 number of high achievers was prompted through the Healey Education Foundation Contest. Historically, those Healey partner schools that had achieved the 85% benchmark by this time in the year were far more likely to achieve their enrollment goals. The Foundation awarded $500 to each winning school. Prize money will be used to host recognition events for the faculty, staff, administration and volunteers who contributed to reaching the goal. Notre Dame Academy students in Minnetonka, MN look forward to sledding in place of physical education class during Catholic Schools Week. Even Fr. John joined in the fun, proving it’s a favorite among all ages. Healey partner schools in the Archdiocese of Baltimore showed particularly strong re-registration percentages in comparison to the same time last year. Monsignor Slade, the highest at 90%, was up from 80%. The other increases: Our Lady of Victory (86% from 21%), St. John Westminster (85% from 81%), St. John the Evangelist (85% from 76%), St. Michael-St. Clement (86% from 35%). As part of Catholic Schools Week activities celebrating the school’s successes, St. John Westminster planned a service project with the Humane League and Paws for Books Fair. Archbishop William E. Lori visited Carroll County’s only Catholic school on Jan. 31 as the school featured its art program, winning robotics team and other academic strengths. Prayer Buddies meet for reading at St. Pascal Baylon in St. Paul during Catholic Schools Week. 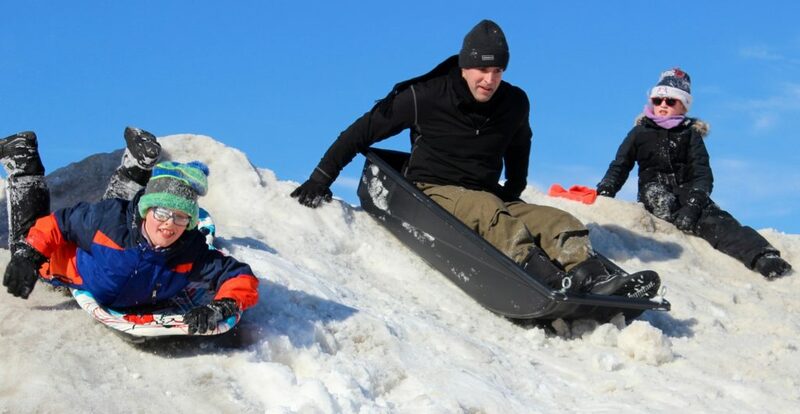 Each year Notre Dame Academy in Minnesota invites students to enjoy sledding instead of physical education class during Catholic Schools Week. 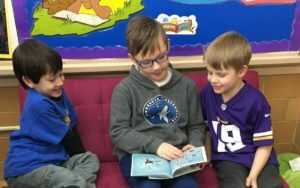 At St. Pascal Baylon, older students paired with their younger Prayer Buddies meet to read together. Building on this year’s theme Come Grow With Us, St. Jerome’s in the Diocese of Allentown included the names of those who re-registered on a themed board. The school not only reached out directly to parents and guardians, but also talked with students about the importance of re-registration and completing the paperwork on time. 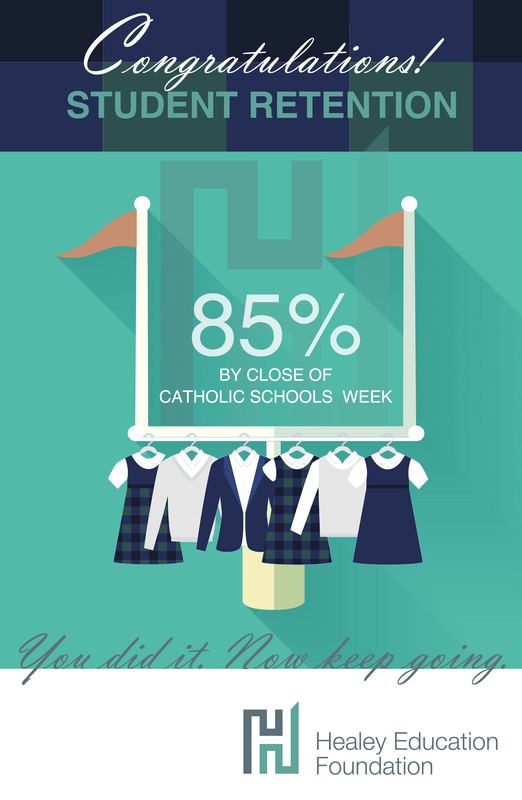 The result: an increase from 71% last year by the close of Catholic Schools Week to 85% this year. St. Jerome Regional in the Diocese of Allentown was among the many Healey partner schools that set deadlines with tiered discounted re-registration fees. Kudos to Our Newest Partner Schools! All four year-one Healey partner schools in the Diocese of Wilmington are contest winners. St. Mary Magdalen opened re-registration in mid-October with a November 22 discounted-rate deadline. By November 15, 95% of families had re-registered. This positioned the school to accelerate its new student application process. 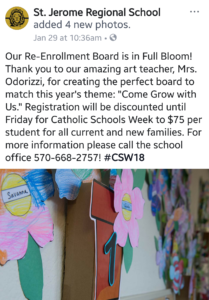 Two schools that traditionally had waited until Catholic Schools Week to open re-registration instead did so in November. 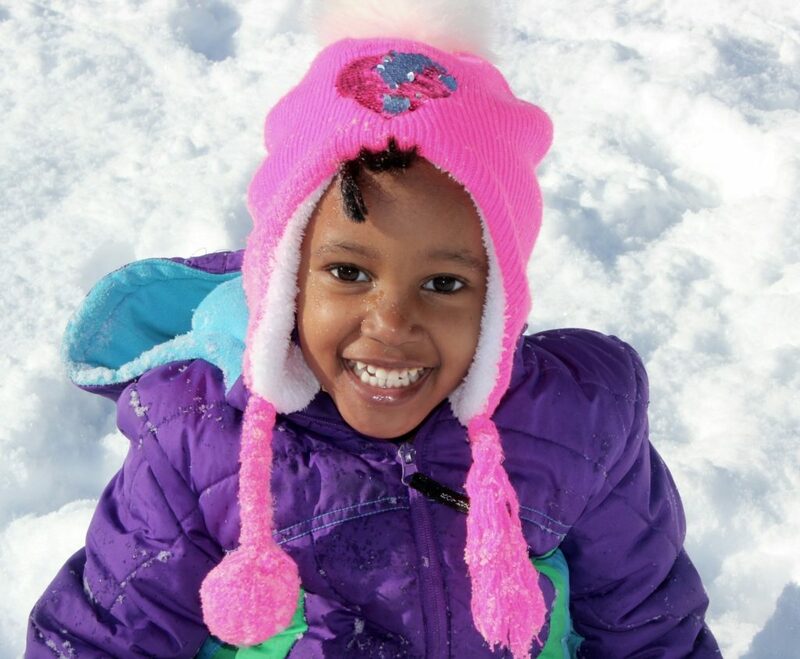 At Immaculate Conception, 86% of families recommitted by December 14. At St. Francis de Sales, 63% of families recommitted by that same date. Anticipation mounted during #CSW18 as the school then issued a challenge to students: reach 85%…and you can help tape the principal to the wall! The video received more than 500 views and over 50 reactions and was shared 6 times. All Saints in Wilmington, DE shared the Healey contest with their school community to encourage families to join in. The school promoted the challenge on Facebook and in its newsletter. In their trademark spirit of collaboration and transparency, All Saints shared our challenge with parents and invited them to join in reaching the goal. All Saints opened re-registration on December 1 and exceeded the 85% re-registration goal by the end of CSW. In sharing its approach to personalized learning, the school was recently highlighted in Renaissance for its innovation in using data to advance student achievement (PDF). Reaching a high re-registration rate by the close of Catholic Schools Week increases a school’s chances of reaching or exceeding its enrollment goal for next school year. The school can then begin to shift its focus to recruitment efforts, especially for those grades that will require a search for new families. Need help in defining your next steps? Your Healey Director of Schools will be in touch. Get ready to spring into action to fill every classroom seat.